Super Hero Boy: Connor just may have a future as a DJ. Connor just may have a future as a DJ. Talk about love at first sight, or that is love at first touch. I've never seen Connor react to a toy like he did to the Vtech KidiJamz Studio keyboard. He may be a bit too young to use the microphone or included mp3 player but that boy has no problems figuring out how to use the other features. I pretty much had to rip it away from him so I could wrap it and put it under the tree. Heh, he may just grow up thinking Santa has been stealing his toys and rewrapping them. 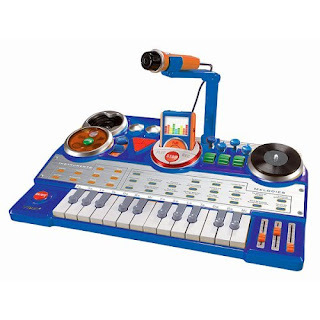 The Vtech KidiJamz Studio has to be the coolest kids keyboard I have seen. It includes a built in microphone and mp3 player which allows kids to not only record the music that they create, on the mp3 player, but they can sing as well. The coolest feature if you ask me is the ability to change the style of music, especially for the smaller kids. With a touch of a button you can change the way the keyboard plays its built in musical effects. Some of the options you can choose from range from jazz to techno with built in songs that change along with the effects you choose including eight built in songs. We had some friends over and their kids could not leave it alone. Come to think about it, I have a hard time leaving it alone as well as its really one toy I really love playing with Connor. Heh, who knows maybe all those rockstar dreams I had growing up will come true with Connor? Nah? Heh, its still fun pretending. You can learn more about the VTech KidiJamz Studio on the Vtech website! You can pick up one of your own over on the Amazon website! What a great toy! It looks like so much fun!